Fifteen volunteers and staff from all over the United States traveled to Bolivia to embark on the first ever Heifer Bolivia Study Tour. After landing at nearly 14,000 feet in La Paz, we felt light-headed, but also filled with anticipation for what was to come. One of the most special events of our trip was the opportunity to take part in a Passing on the Gift Ceremony. On November 12th, after a 2.5 hour drive from Cochambamba, (filled with endless bumping up and down the rocky, one way road into the valley), our Heifer group finally arrived in Pajcha Baja. Many of us had been suffering to varying degrees from altitude sickness, but we were determined not to miss this ceremony. The entire village had turned out to greet us with friendly handshakes, a kiss on the cheek, and many kind words of Bienvenidos and Gracias for making the journey. People and sheep alike strolled around the open square between the surrounding buildings, and we could sense the excitement for the ceremony that was about to begin. The women were all in their finest layered skirts and wide brimmed white hats. Chairs were brought out from the little school and we found a little shade against the side of the building, protecting ourselves from the intensity of the sun at such a high altitude. After the official speeches were delivered and the thanks were offered, it was time for the Passing on the Gift ceremony. We leaned forward like kids on Christmas morning, so excited to see what would burst forth from the shaking, bouncing green bags! A representative from the donor family would step forward to have their name read, a list of the animal(s) they had received and the name of the donor would also be read. 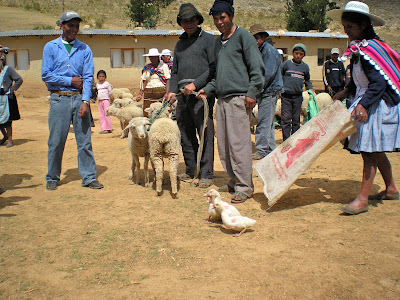 The donor would then place the leash for the sheep in the hands of the recipient. After the main gift of a sheep, the excitement really began! Each person would step forward with a bouncing green bag, open it and gently drop forth whatever animal was hidden inside. Squealing piglets, clucking chickens and quaking ducks all emerged somewhat stunned into the mid-day sun. Children ran in all directions to chase down the scurrying animals and to return them to their rightful recipients. 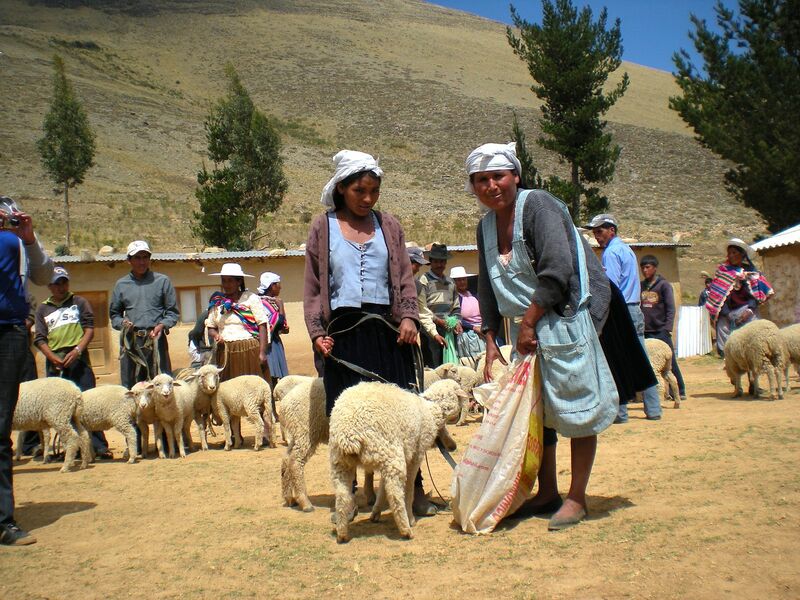 Some of us, as well as some of the Quecha people, both men and women, were in tears, overcome by the moment. It was, in many ways, beautiful and powerful, but it was also joyful and funny. We felt incredibly honored to be able to share in this moment with these generous people, and to congratulate this community on having achieved so much in such a short period of time.